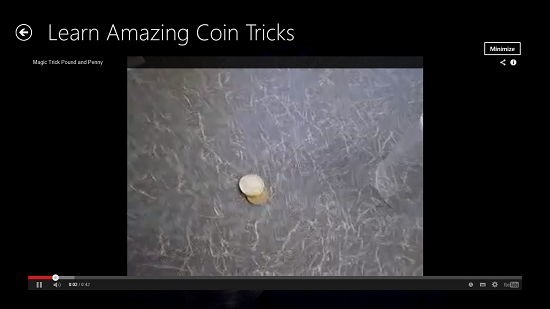 Magic tricks lessons allows you to learn a plethora of magic tricks for absolutely free on your Windows 8 or 8.1 device. The app has an interface which allows you to access the videos of various magic trick lessons. You can simply select a video for playback by clicking on its respective tile in the Start Screen. Once a video file has been clicked, you will be taken to the video playback interface where you will be able to play the video via the playback toggles. You can also choose to snap the app to either side of the screen, and the app still remains fully and completely functional. 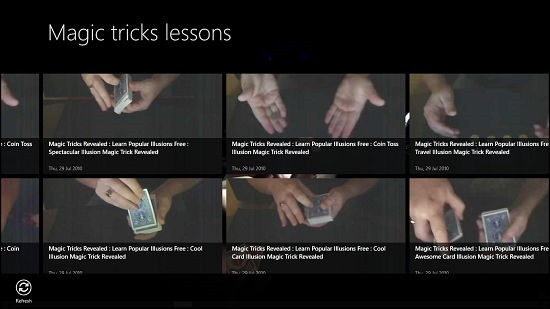 Magic tricks lessons can be downloaded off the Windows App Store for absolutely free. Magic tricks lessons app when fired up on your device will present you with an interface which looks like the below screenshot. You can see that as soon as you launch the app, you will be presented with an interface of various video files on your screen which you can click on at any time to start the video playback. Each video in the app is very informative and allows you to learn a large number of magic tricks while sitting at home. When you click on a video tile, you will be taken to the video playback interface. The app basically doesn’t store any video files and hence always requires an active internet connection to run. You can toggle the playback via the playback controls at the bottom of the screen. Going back to the previous screen at any time in the app is as easy as clicking on the back arrow button, and once you are in the main screen of the app, you can also refresh the feed of videos by right clicking to launch the control bar, and clicking on the Refresh button at the bottom left which is visible in the screenshot below. The refresh button will add new videos to the main screen if at all any new videos are available at the time of pressing the Refresh button. This basically wraps the main features of the Magic tricks lessons app for Windows 8 and 8.1 devices. Feel free to check out the Number Magic and Paint Drops apps which we have reviewed earlier. Magic tricks lessons is a pretty well designed app for Windows 8 and 8.1 devices which allows you to learn a variety of new and interesting magic tricks at the convenience of your home. The app is very lightweight and completely free with no hidden charges whatsoever. You can definitely wake up the inner magician in you with Magic tricks lessons! My rating for the app: 4.5 out of 5!